Some time ago I've seen an inspiring talk from CppCon 2013: "C++ Seasoning" by Sean Parent. One of the main points of this presentation was not to use raw loops. Instead, prefer to use existing algorithms or write functions that 'wraps' such loops. I was curious about this idea and searched for nice code examples. Here is my short list of usage of algorithms from the C++ std library that might help in writing better code. Of course. I could not skip two prominent examples from the original "C++ Seasoning" talk: slide and gather. In just two lines of code! Rotate(first, middle, last)- takes a range [first, last) and rotates it so that the middle element becomes the first in that range. upper_bound - Returns an iterator pointing to the first element in the range [first,last) which compares greater than val. The range should be already sorted (or at least partitioned). How do those two elements combine into Insertion sort? std::upper_bound(start, i, *i) returns position of the first element greater than *i. Then, the range is shifted, so that i-th element becomes first. 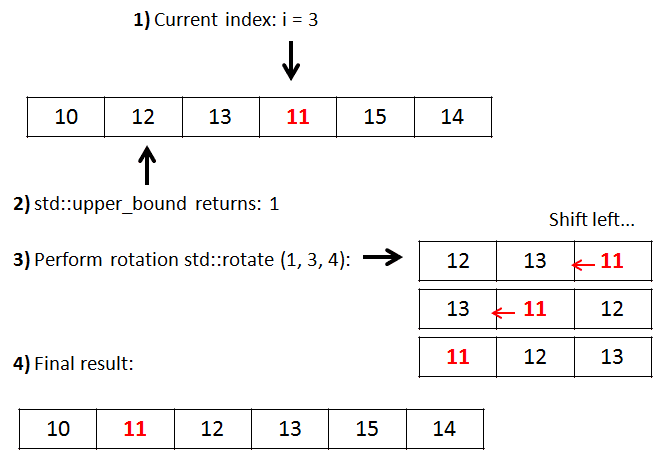 I will not describe quick sort algorithm... you should know how it works already! In this implementation std::nth_element is used to do most of the job. This function partially sorts the range so that given n-th elements is placed in proper position. All of the elements before n-th element are less than or equal to the elements after the n-th element. As an example, you can imagine a list of items on a UI dialog. User selects a continuous range and then algorithm takes this range and move it into some other place of the list. this function uses std::rotate: to move elements forward or backward. it returns two iterators - the start and the end of the new sequence. In C++11 std::rotate got new version and now can return iterator to the new position of p element. if you are not interested in returning of this iterator pair, you can simplify this code much more. In GCC 4.9 (and previous versions) std::rotate does not return an iterator, but only void. So currently, this code will not work there. It's use case can be similar to slide: select elements - using a predicate s (so this time continuous range is not needed), then gather those elements into a range and move this range to position around p. It returns the start and the end of the selected range. UnPred is a predicate that returns if a given element is selected or not. Reorders the elements in a given range in such a way that all elements for which the predicate returns true precede the elements for which predicate returns false. Relative order of the elements is preserved. std::not1 does not work with the code correctly, so there is proposal to use simple lambda. Read more here in Sean's comment. trim left: std::find_if returns iterator to the first non space character in the string. Then we erase those characters. Note: you can also use boost string algorithm to make life even easier. This algorithm is a variation of Bogosort and other similar 'sorting' algorithms. Read more on wiki. As victor_zverovich noticed, in Bogosort the next permutation is chosen at random, but std::next_permutation gives the next lexicographically greater permutation. 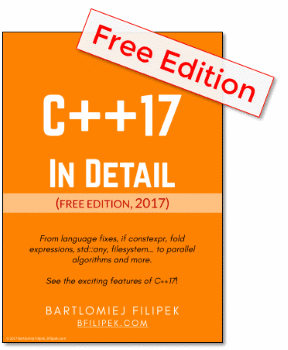 I've showed several, I think nice, code examples where algorithms from C++ Standard Library are heavily used. Maybe next time, when I'll be writing some ugly piece of code I'll stop, think for a minute, and maybe some existing algorithm/function could be called instead. Do you know some more interesting examples? My list, definitely, does not show all of them! C++ Seasoning, by Sean Paret @Channel9 - original inspiration for this article.